About 10 days ago we ran a a poll about which languages/APIs people use when writing their Apache Kafka Producers and Consumers. See Kafka Poll: Producer & Consumer Client. We collected 130 votes so far. The results were actually somewhat surprising! Let’s share the numbers first! 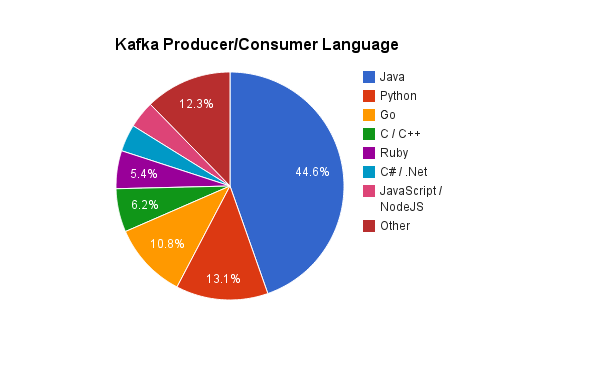 Java is the dominant language on the planet today, but less than 50% people use it with Kafka! Read: possible explanation for Java & Kafka. Python is clearly popular and gaining in popularity, but at 13% it looks like it’s extra popular in Kafka context. Go at 10-11% seems quite popular for a relatively young language. One might expect Ruby to have more adoption here than Go because Ruby has been around much longer. We put C/C++ in the poll because these languages are still in use, though we didn’t expect it to get 6% of votes. However, considering C/C++ are still quite heavily used generally speaking, that’s actually a pretty low percentage. The “Other” category is relatively big, at a bit over 12%. Did we forget some major languages people often use with Kafka? Scala? See info about the Kafka Scala API here. Everyone and their cousin is using Kafka nowadays, or at least that’s what it looks like from where we at Sematext sit. However, because of the relatively high percentage of people using Python and Go, we’d venture to say Kafka adoption is much stronger among younger, smaller companies, where Python and Go are used more than “enterprise languages”, like Java, C#, and C/C++.